and headliner acts and entertainment at the on-site Showroom and Event Center. and Boxing Hall of Fame. The combination of upscale amenities and unparalleled service make Turning Stone Resort Casino a sought-after destination for business events. 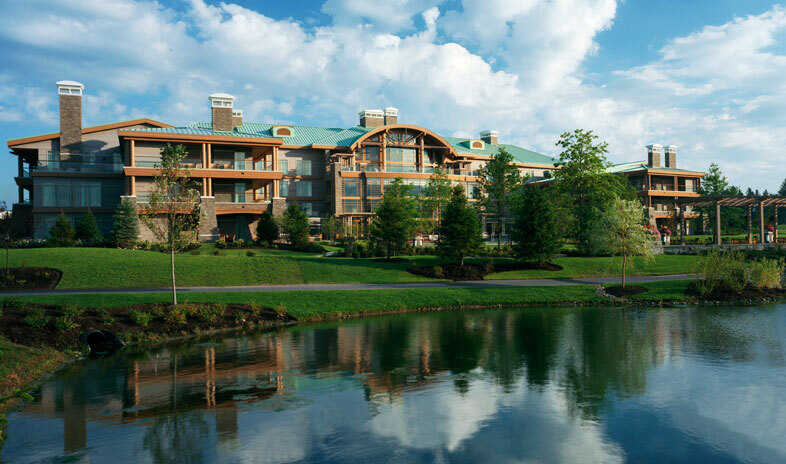 Set just 30 miles east of Syracuse, New York, the resort treats travelers to deluxe accommodations, championship golf, celebrity entertainment, and conference facilities able to host groups of 15 to 2,000. Turning Stone’s 125,000 square feet of meeting space hosts groups in 24 breakout rooms, an elegant ballroom, spacious Event Center and several prefunction areas. Meeting events on-site also receive the benefits of high-tech equipment, experienced audiovisual technicians, a business center, and in-house gourmet catering. In 2015, the meeting facilities earned the Best of the East Award from Meetings Focus and a Gold Tee Award from Meetings & Conventions magazines. After meetings, guests can enjoy the entertainment offerings at the resort’s nightlife complex, Exit 33. Its four venues range from Tin Rooster, a barbecue restaurant and dance hall, to Turquoise Tiger, a sophisticated lounge with a film noir vibe. Guests choose between lodging in four hotels, among them, the all-suite Lodge at Turning Stone—a Forbes Four Star and AAA Four Diamond Award winner —and the high-rise Tower, also a recipient of the AAA Four Diamond Award, and known for its unobstructed 20-mile views. But that’s not all. The resort houses a luxurious destination spa, a world-class casino, 21 dining options, and five golf courses, one of them Atunyote Golf Club—a Tom Fazio design named in Golfweek magazine’s 2016 list of Greatest Public Courses. I have worked with the staff at Turning Stone for several corporate events and have never been disappointed. From sales to food and beverage to transportation, the attention to detail and level of customer service is outstanding. They are willing and able to take care of any and all your corporate needs so that your event goes as smoothly as possible. Our attendees agree too! As we're proud of saying at Aspen Dental Management, Inc., the Turning Stone team goes "beyond above and beyond." Turning Stone Resort and Casino was the site of our 2-day wedding weekend. We couldn't have been happier or more impressed. We held our multi-day Hindu-Catholic wedding over the weekend in July 2014. We currently live overseas for work, with the groom's family being from Toronto, Canada, and the bride's family being from southern New Jersey, USA. So we were planning a two day wedding from over 1,000 miles away, with families from two different countries, and from two different religions. We knew it was going to be quite a complex wedding and a lot of work. There was no way we could have pulled this wedding off if it wasn't for the spectacular team at TSRC. We were extremely impressed with how organised, streamlined, yet flexible the entire planning process was with them. Due to our strict schedules, we had to arrange a meeting with them in late December, while many of their staff members were on vacation. Yet, they still managed to arrange to have their florist, baker, chef, event coordinator, and banquet manager meet with us back-to-back, despite some of them being on vacation, in order to accommodate our schedule. These guys are professionals! It was this dedication to 'getting things done' in a very professional and efficient manner that we consistently experienced from all of the staff at TSRC throughout the entire wedding, from the event coordinator, all the way to the valet parking staff, In TSRC we found not only an amazing location but an event coordinator who was willing to answer every e-mail, search down every lead, and accommodate every far-fetched wish that goes along with holding a multi-religion wedding in upstate New York (and trust me, we had many). We felt so secure knowing that we were leaving it in Allison's trustworthy hands. The banquet manager, Karen, was fantastic. Her years of experience really shone through in the way she handled every single issue that cropped up with expertise and grace. No wedding ever happens without some logistical and operational issues, however with Karen at the helm, we barely even knew that there were any problems. All of the many many pieces of our complex wedding just fit together...seamlessly. On top of all this, the food was excellent! It's not too often people make it a point to come up to you and tell you how great the food was at your wedding, however has now been months later and we're still hearing about the excellent food from our guests! TSRC truly does go above and beyond. The Turning Stone Resort & Casino played a critical role in driving the huge success of the recent 2014 Northeast Fiber Optic & Telecommunications Conference. The Sales, Golf, Convention and Catering managers are true professionals, as are each and every one of their employees. Their attention to detail, value and impeccable service quality / delivery was evident throughout the entire event; from start to finish. Our exhibitors, attendees and guests were all extremely pleased with the Turning Stone's room accommodations and particularly its full-service venue. With our golf tournament reception and pre-Conference "Kick-Off" Party being held at the Turning Stone's "The Gig," there was absolutely no reason for anyone to leave the event. And of course, the food was fantastic. I placed my personal and professional trust in the highly experienced professionals at the Turning Stone, and I'm glad I did. They know how to facilitate the success of the events that companies, groups and individuals hold there. I highly recommend the Turning Stone and its excellent staff; they continually exceeded my expectations, and I know they will do the same with yours. The Turning Stone Resort & Casino is like my home away from home. We have been running Fred Astaire Dance Competitions at this venue for 6 years and we are never disappointed. The Lodge is a beautiful and serene property and they always exceed our expectations. The food is outstanding and the golf and spa facilities are unmatched. From the sales process with Karen Rogowski to the event itself with Christy Thomas, we are always in great hands and there is nothing they won't do to make sure our events are successful. It is the one event on our calendar which I always look forward to attending as it always recharges me for our very hectic schedule. I'm so looking forward to our 2015 event in June, I'm already counting the days. New York Dance Enterprises, Inc.
Our company has held multiple staff and provider meetings at the Turning Stone. We also held a private dinner meeting for 8 guests and it exceeded our expectations. The customer service, food and venue are stellar each and every time. We have our Holiday Party for 2014 booked at the Turning Stone for the first time and we are very excited about that.Scott, Loriann and Allison are professional with exceptional customer service skills and I enjoy working with them and their entire team. This location is worth the trip! The spa and golf are first rate. The restaurant at the lodge is wonderful. The rooms are very spacious, with lovely views and the bathrooms are over the top! Definitely an incentive destination. Nonsmoking on the casino floor. Turning Stone proved to be an ideal location for our larger conference. The option of having 20+ breakout rooms available made it easy for smaller group gatherings and discussions. The accommodations were very chic and sophisticated and gave attendees a different touch of elegance that they normally do not experience. We decided to go to Turning Stone for this conference because of their variety of onsite dining, since most of our meal functions are on own.